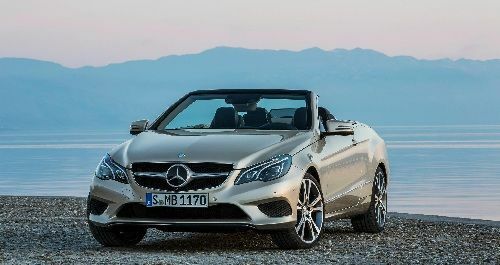 Mercedes-Benz today released photos and information about the new 2014 E-Class coupe and convertible (cabriolet). The two vehicles compliment the already released sedan and wagon. Styling, interiors, powertrains and safety systems top the list of changes to these leaders in the premium mid-size 2-door vehicle niche. The 2014 E-Class coupe will have a B-pillar-less design. This provides for a more visually appealing profile and is very attractive with the glass up or down. The rear glass does recess fully. The front ends of both vehicles are more V-shaped and aggressive than prior designs and the two also have the appearance of being flatter to the ground. This convertible looks very much like an SL or SLK in many views. Large, lower air intakes that are blacked-out give the cars a menacing look. Standard headlights are LED trimmed and full LED lighint is optional. Both have a CLS style sloping rear roof line that is the current trend in coupes today. The convertible does look smart with the roof up, something rival Audi struggles with mightily in the A4/A5 and S4, S5 convertibles. In back the rear bumper is de-emphasized and thinner. Both 2014 E-Class cars will be offered with the corporate 3.5 liter V6 and also a 400hp, 4.6 liter twin-turbo V8. All engines are now direct injected. The cars come with 7 speed Direct Shift automatic transmission. In a nod to fuel efficiency, if the manual mode is selected, but not used for a period of time, the car will revert to automatic shifting to save fuel. These coupe is also offered with 4MATIC All-Wheel-Drive in the E350 V6 version. Interiors offer two tone trim with some new color combinations such as blue and beige. The shift lever (PRNDL) is no longer in the center stack to free up space for storage and Venti size cup holders. French stitching on the seats looks rich and the overall scheme is classic modern Mercedes. There are two bucket seats in back. The infotainment screen grows to 7 inches, all the better to take advantage of the current Command and embrace information and safety systems. The Mercedes AIRCAP system carries on of course, and it is now able to retract when not in use so as to improve the look of the car. Mercedes has also improved upon the already great headliner to ensure noise free cruising. The new 2014 Mercedes Benz E-Class coupe and cabriolet join the sedan and wagon in the Mercedes lineup this summer.